Black high gloss body, maple neck and fingerboard, 34″ scale length, with DiMarzio P bass humbucking pickup and series/parallel switch. This is a good quality Japanese made bass from the early 1980’s probably made in the Matsumoku factory. 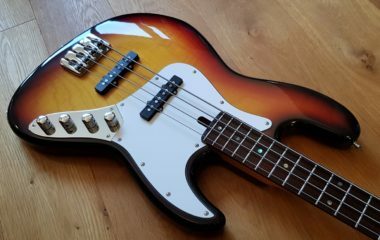 Prices don’t appear to have caught up yet with other similar era basses so a good buy right now. This example is in very good all original condition. A few marks and scratches here and there, but nothing bad or very noticeable. Plays very well, lovely arrow-straight neck and has just been serviced and set up. Comes with the original gig bag which is a nice touch.